Chesterfield loanee Jamal Campell-Ryce has backed fellow winger Gboly Ariyibi to go as far as he wants in the game. Both wingers were instrumental in the Spireites’ 3-0 victory over Bury on Saturday, a result that guaranteed League One football at the Proact next season. Sheffield United’s Campbell-Ryce, on loan until the end of the season at Chesterfield, has been dishing out the advice to his young team-mate. Addressing the 21-year-old’s potential, the wide man 12 years his senior said: “He’s a real talent. Every day I’m on to him, don’t disappoint full-backs by not getting at them. “I’m encouraging him, I’ve been where he’s at, he’s got the ability to go on and do whatever he wants to do. “As long as he listens, keeps working hard and keeps on stripping full-backs game in, game out, he can go where he wants. On Saturday Chesterfield put in what Campbell-Ryce hailed as their best performance since he arrived on loan in March. He was delighted to help the club secure safety. 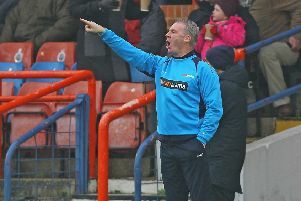 “Very pleased, I thought we were outstanding and passed them off the park. The final game of the season on Sunda, at Bradford City has nothing riding on it for the Spireites, but Campbell-Ryce sees it as an opportunity to put an exclamation mark on the campaign. “We can go out, play freely and express ourselves. Hosts Bradford have guaranteed a play-off place but still have the opportunity to book a home time in the second leg.